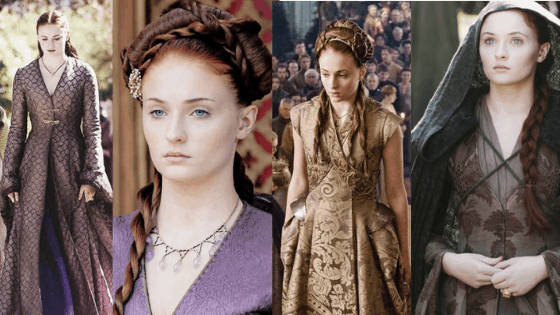 In the previous posts for our Game of Thrones Countdown series, we have covered three queens, Daenerys, Cersei, and Margaery, who have changed a lot over the seven seasons. But none of these regents have gone through a change like Sansa Stark. Sansa Stark has seen perhaps the most intense character development of anyone on the show. And this development shows through drastic changes to her wardrobe. 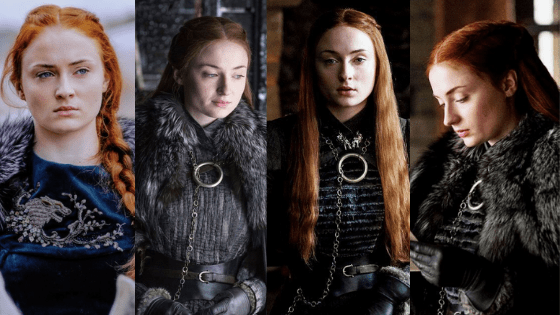 Sansa started off as bratty princess, but has grown into a strong woman who is focused on seeking revenge for her family and leading the people of the North. She is now someone who demands respect and loyalty, and isn’t afraid to get her hands dirty. 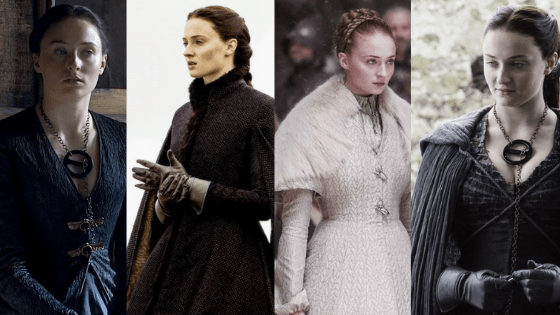 Let’s take a closer look at the many transitions Sansa has made throughout the show, through the lens of her wardrobe. In the beginning Sansa is a foolish girl who dreams of marrying Prince Joffrey and becoming his future queen. She is bratty and rude to those who care for her, and blindly trusts Queen Cersei. In season two, Sansa becomes a prisoner to King Joffrey, and is essentially his toy to torment. This when Sansa starts to realize that her dream, in reality, is a nightmare. However, she still must keep up her foolish and innocent facade in order to protect herself. 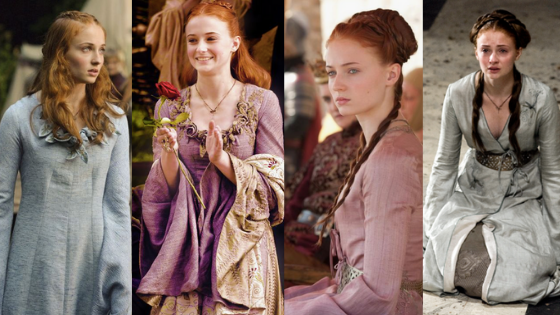 Throughout these seasons, Sansa dresses like your typical sweet princess. Many of her garments are softer and more girly versions of Queen Cersei’s garments. She chooses to wear garments that are kimono styled, featuring a wrap around affect and long, billowing skirts. Most of her garments have flower and bird embroidery, to emphasize her nickname “Little Bird.” She often wears dresses made in pastel shades, to enhance her innocent look. In the following two seasons, Sansa no longer wants to be a queen: she would rather be set free and sent home. Unfortunately, it’s not that simple. In season 3, Sansa marries Lord Tyrion against her will, and continues to be a prisoner of King Joffrey’s. In season, 4 Sansa finally is able to escape the clutches of her captors, and set off on a new journey. She also leaves the girl she once was behind and starts to become a woman. In these seasons, Sansa chooses to wear the color purple, as a symbol that she is mourning the loss of her home and her family. She begins to wear dresses that are a cross between the styles worn by Queen Cersei and the styles worn by the people in the north. As a result, the dresses that she wears are still a kimono style, but are more button-down and feature purple and golden patterns embossed into them. Season five is the most tragic and challenging season for Sansa. She marries one of the cruelest characters in Game of Thrones history, Ramsay Bolton, who enjoys torturing her at every moment possible. Yet, this is also the season where Sansa leaves girlhood behind and becomes a true player in the game of thrones. She learns to be manipulative, keep secrets, persevere, and defend herself. In the first half of the season, Sansa primarily chooses to wears black dresses. The dresses feature feather details, which shows she is being heavily influenced by Littlefinger, whose sigil is a mockingbird. At this time, she takes on a femme fatale appearance in dark colors. In the next two seasons of the show, Sansa becomes the person she was always meant to be, the Lady of Winterfell. At this time, Sansa decides she is done with taking orders from others. She takes charge and seeks revenge on her enemies. She puts aside the princess she once wanted to be, and instead chooses to be a political force who is not afraid to take risks. Her wardrobe during these seasons consists of dark grey, navy blue, and black colors, with elements of chain metal and fur. Her look contains many elements of her family’s house animal, the wolf. She mixes dresses with wolves embroidered into them, wolf pendants, and giant fur cloaks, that give off the appearance of a wolf. What do you think of Sansa Stark’s style? Do you think Sansa will remain the Lady of Winterfell in the final season of the show? Or do you think Sansa will perish? We very much look forward to seeing what she wears in the final season.